World premier reissue on CD! 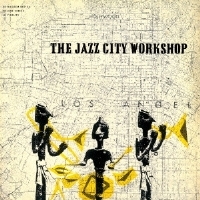 The Jazz City Workshop is a very special album produced by the Los Angeles office of Bethlehem. The producers loved Jazz City, a premier Hollywood jazz club at the time, and with an intent to preserve the kind of jazz that was being performed there, took musicians who regularly perform there into a studio. And what a great group it was! While there was no nominal leader for this album, the most prominent in terms of solo space was Marty Paich on piano, Herbie Harper on trombone, and Larry Bunker on vibraphone. A solid rhythmic foundation was provided by bassist Curtis Counce, drummer Frank Capp, and Jack Costanzo on bongos. Singer Mickey Lynne appears on "That Old Black Magic." The music is wonderful, and we are grateful that Bethlehem took steps to preserve this music. The famed club closed its doors less than two years after these sessions were recorded. Highly recommended to fans of West Coast Jazz! Recorded on November 19, 1955. Mono. This reissue CD was released in Japan by Solid Records in 2013.